The MP Cleaner combines several effective cleaning processes in one machine made from stainless steel. The SPS-controller permits a comfortable, fully automatic operation. In this way, different parameters and treatments can be chosen, as well as the configuration of different programs (e.g. batch related) for the cleaning processes inside the closed cleaning cabinet. Oscillating dipping function/ pressurized injection: The parts are cleaned by pressurized injection thanks to the dipping movement and the patented clack valve system. Spray cleaning: (High pressure and low pressure): The parts inside the washing basket are cleaned by spraying nozzles, while the basket slews and rotates inside the cabin. Dipping: During the dipping process, the parts inside the washing basket can be slewed and rotated. Ultrasonic: Ultrasonic cleaning systems intensify the cleaning performance and can be employed in alternation with basket movement and the pressurized injection. Vacuum drying: The vacuum drying is used for a quick and efficient drying of the parts. Blowing: The parts are blown off with a high airflow while the washing basket remains in the upper position and effectuates a rotating movement. The more process machines from SPORER are compact machines made from stainless steel. They are easy to use and easy to maintain. The user disposes of a big touchpanel and may chose different optional equipment, e.g. 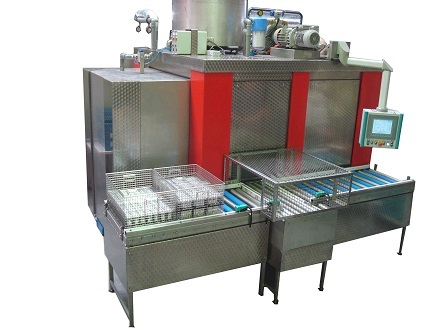 the remote maintenance of the controller, collecting pans, chemical dosages, loading systems, demineralisation systems (necessary for a stain-free drying) etc. The standard dimensions of the washing baskets are the MP Cleaner 5/3/2 and the MP Cleaner 6/4/3. Other dimensions can also be realised with the needed cleaning processes. Thanks to the modular construction system of approved SPORER technologies, we are able to realise a more process machine completely adapted to your requirement.